I couldn’t quite put my finger on it. I knew there was something…but really couldn’t quite gather enough thought process to find out what. And yet slowly whatever it was, it built up. I couldn’t write. I couldn’t draw. I couldn’t take any pictures and I sure as eggs couldn’t think what on earth it was that was slightly sitting out of alignment. So I stopped. Stopped trying to put my finger on it and closed the lap top. Said bugger the homework. Put another jacket on us all and headed out. The rules of the afternoon, the time constraints, the blah, blah, blah. Yep, today they didn’t count, as today….there would be no rules. You know why kids can play so beautifully, for so long, so uninhibited? Because their rules are different, and they don’t care particularly if they break them. If the row of animals isn’t put away before going to bed, life turns out, does continue on. If homework isn’t done on a one off Wednesday, doing double the next day is actually ok because the afternoon before, oh it was rather awesome. So why was it, that it wasn’t until I had stopped, did I realise it was all the rules that were choking me and leaving me on edge? I have no idea. Really absolutely none. But on the upside I know how good it felt when we broke all the rules that afternoon in late winter and I have every intention of doing it again soon. Now this is a quite a moist, dense cake, that for me looked like a cake, but tasted like a pie, it kind of broke all the cake rules right there. Looks like a cake, but tastes like a pie… this was a fine thing to realise indeed. This entry was posted in Food Glorious Food and tagged pecans., pumpkin, pumpkin loaf, Pumpkin spiced cake, spiced cake by cityhippyfarmgirl. Bookmark the permalink. Ive never liked the expression ‘time poor’. However it describes what we impose on ourselves on a daily basis. I’m pleased that you realise how we can choose to use spend time. After all we just don’t know how much time we have been allocated. To enjoy precious moments enriches us all. And, that will never make us ‘time poor’ during our lifetimes. I love this post. Your story about rules rings very true with me, I totally recognised myself. Thanks for sharing and now I know what to do with my left over pumpkin, perfect! Irene, it’s so easy to get caught up in the day to do day, it’s sneaks up on you at times. Hope you can break some rules some time this week. That cake looks perfect for a wet Sunday’s baking — which today is. Thanks Brydie. I hope you are all jumping in puddles today. Always scanning for puddles Rose! A thought provoking post. Sometimes we have to break the rules and redefine them because life changes. Delicious looking cake. As for this cake – beautiful in every way. I can almost smell it through the screen! It’s all yours Ms Narfy, veganise away and I hope it hits all the right spots for you. Glad you had a good time away with your daughters too. Breaking the rules and a cake that tastes like pie, huh? I’ve got some pumpkin that needs to be used in my fridge – this may be what it gets transformed into. Did your kids like it? two out of three Sara…the third one, well I had his share. 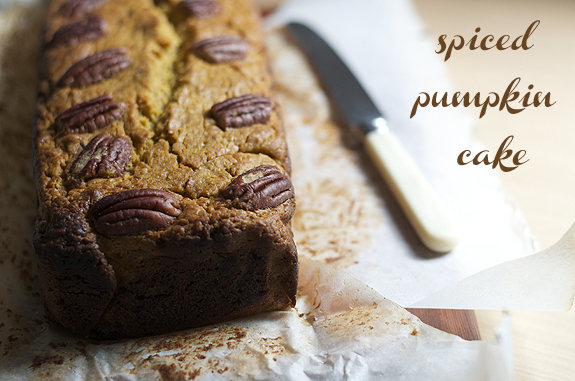 love the sound of a pumpkin spiced cake, looks delicious! 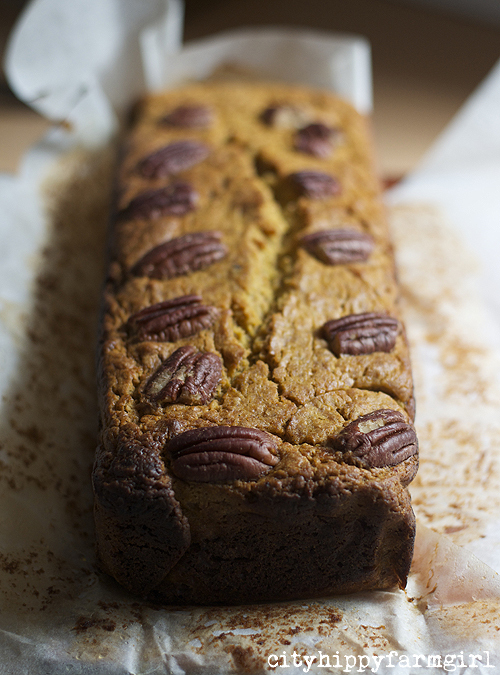 Love spiced pumpkin cake. Might need to bake one this weekend and break the rules and eat it for breakfast! I cannot wait until we have a proper kitchen again so I can get back to baking and all things cosy and fun! Your cake looks SO GOOD. In order to break them- you have to have them first! I am a bad one for not following rules- and sometimes it even works out well! 🙂 I like a cake that tastes like pie- putting this recipe front and center for pumpkin harvest time! I hope you like it dear Heidi, and I love that you are not a rule follower.